I enjoyed reading the book, however as it progressed it was choppy and didn't flow well. It seemed the author was trying to finish quickly and stuff too much in before ending. The societal rules and ways of today were mashed with those of a presumably Jewish type community. some things seemed researched and others not. women were not allowed to tag along with the guys to meetings etc. The romance scenes seemed added for interest? Just seemed awkward. For just a fun quick read it was enjoyable. This book is a continuation of KC Grant's "Abish: Daughter of God." Abish's journey continues as the Lamanites turn on each other as religious unrest grows throughout the land of Ishmael. She and her young children flee to Zarahemla with the other Nephites, but the challenges aren't over. Years of war takes its toll and even the most faithful are put to the ultimate test. I know it's bad, but it was boring and I mostly skimmed it. While I love the first book due to the knowledge we do actualy have about Abish, this second one is not entirely backed by anything in the Book of Mormon. The creative license here in the second book would be even more wonderful if we knew what had actually happened to Abish after the events in King Lamoni's court.But to link her with the mothers of the 2000 stripling warriors of the people of Ammon does sound plausible.I did enjoy this second one though and I do recommend it of you love good fiction. Leave it to K.C. Grant to pull a bonus novel out of a character from one passage of scripture, just by doing a little math. It does follow that Abish, had she been the age as in the first book, would have been one of the mothers who taught the Stripling Warriors to have faith. Not as cohesive as the first one, this one covers a lot of ground, and a lot of time. It's more like a bunch of books bound together. DNF. I pushed through to page fifty. Each chapter averages about five pages, but within those five pages they average five scene breaks. It makes for a very choppy read. As a result, I had a hard time connecting with the character, which is a shame, because Abish is a fascinating historical figure and I really wanted to love this. This made for a very nice Sunday read as I was at home sick all day:) Grant writes a second book about the Book of Mormon character Abish by imagining her life after the account in the scriptures ends. The emphasis is on the character, rather the plot or the time period, but I found it to be a good read with nice tie-ins to scriptures. A long story for a person mentioned one time in scripture. However it helped make sense of the battles that were raging at the time. Finally culminating in a very small part about the stripling warriors. I enjoyed the first book Grant wrote about Abish and I enjoyed this one too. It really does make one think about what it might have been like in those times. It could have happened the way this author portrays it. It makes the Book of Mormon come a live. Wonderful follow-up yo Abish! I loved it! Loved the extension to Abish's life, trials, patience, and great faith. I loved this story given through an intimate point of view. However I hate how I'm many places years were skipped over. Especially felt the end was rushed. Interesting but somewhat melancholy. The stripling warrior thing was a very minor part of the book, still I did enjoy it. A nice story on what Abish's life might have been like being a part of the Anti-Nephi-Lehies. Great sequel to Abish Daughter of God. In this one she must rely on her faith to get her through some really tough times! Sometimes it wavered... but just for a moment! Lovely story of triumph and faith. Not as good as the first book. A little too long-winded for me. Enduring the ravishes of war and losing her beloved Jared because of hatred, and then raising her children alone because of it--Abish a remarkable woman. I guess if you don't pat yourself on the back--who will! Listened to it. I don't know if I was just in a distracted time frame while listening to this or it was the books fault. It was interesting to think of the people of those days though. K.C. Grant - K.C. Grant loves to write! From bad poetry at the age of seven to not-too-much-later attempts at a novel where the main character was a talkative red-haired girl (yes, that wasn't very creative) she has loved to create stories. In her adult career, she has written for family oriented magazines like BackHome, Parents and Kids, The Washington Family and LDSLiving. She was so excited about the release of her first novel in 2010, "Abish: Daughter of God." 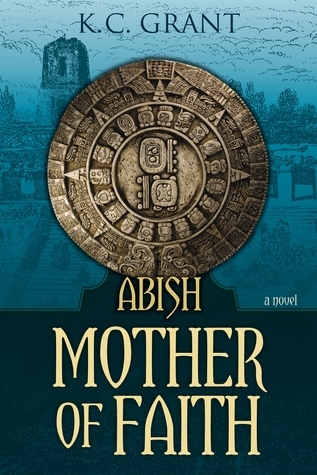 A sequel, "Abish: Mother of Faith" continues the story of Abish and focuses on the mothers of the stripling warriors.K.C. will also get to continue her fascination with the setting of Mexico (this time with a modern twist) when her suspense novel titled "Venom" which came out January 2012. She also belongs to three writers' groups and various other organizations that keep her very busy.